I'm currently in limbo and don't know yet whether Christmas is cancelled or not! Last Sunday I packed the kiln full of pots for a bisque firing. 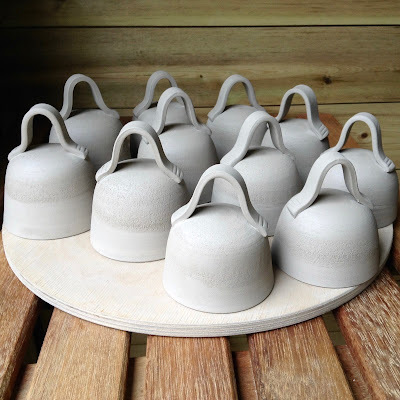 Most of the pots are Christmas stock ready for the busy season and include a batch of Christmas Bells (see the photo above). 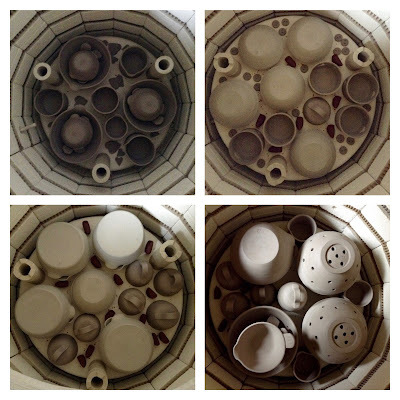 Everything was going well with the firing and seemed normal right up until about 550 - 600 degrees C (which was when I went to the kiln room to put the bungs in). I noticed an odd smell, but thought it was probably just an excess of steam and vapour coming out of the vent. 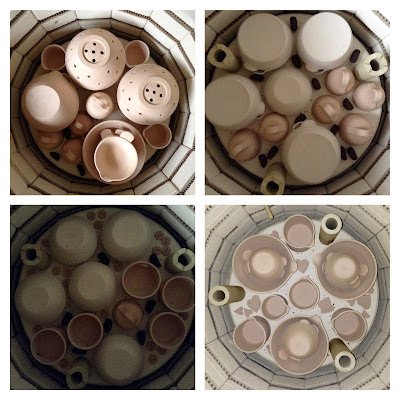 Now the seasons have switched over, my pots are taking longer to dry. So I thought maybe some pots were a bit 'damp' when I packed the kiln, and this was causing the fumes. It wasn't until I went to turn it off at the end of the firing a couple of hours later that I realised something had happened. Opening the kiln room door, I could see the kiln was glowing orange but the controller and electrics were dead. At this point my heart sank. I checked the trip switch but that was fine. So something must have happened further down the line. It was evening and I'm always tired on firing day, so I felt pretty down. 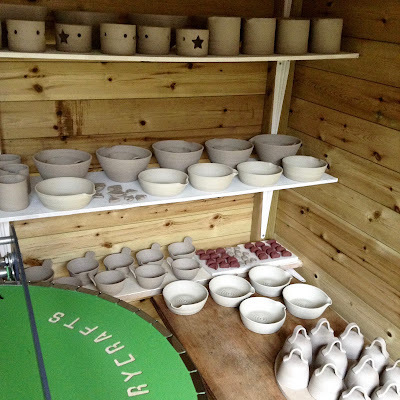 I was also frustrated with myself for not checking in on the kiln every hour to see progress. So I had no idea what temperature it got to before it went kaput. But the fact the kiln was glowing orange suggested that it might have got close to bisque temperature (which in my case is 1000 degrees C). Pottery is mostly a waiting game, so there was nothing I could do except leave it to cool. This would take at least a day and a half before I could risk cracking it open. In the meantime I must have gone through every possible scenario: explosions from damp pots, collapsed shelves, burnt out elements, frazzled electrics, mice chewing through the wires... I was preparing myself for losing all of my pots (that's a month's worth of work) and having to start again. Finally Tuesday morning came and I opened the kiln. And this was the result (below). Unbelievably all the pots had bisque fired perfectly! Or at least it seems like they have. They all feel and look like I expect a bisque pot to be. I haven't tested any yet to see how they take on glaze, but I'm pretty sure they're fine. So I'm absolutely chuffed and relieved. I also discovered that my isolation switch for the kiln had cracked and a part of the plastic casing has melted. Probably this was the source of the smell. Everything else 'looks' fine (elements, thermocouple, wiring) so I have all my fingers crossed that it was just the switch. I have to wait again though (until next week) before I can get a new isolation switch fitted and have the kiln checked out. So the saga isn't over.